Rarely a book emerges that is possessed of – at the same instant – slicing insight through verisimilitude and the unique throb of the surreal, with enough grip to strangle and enough bizarre magic to make it curiously unforgettable. 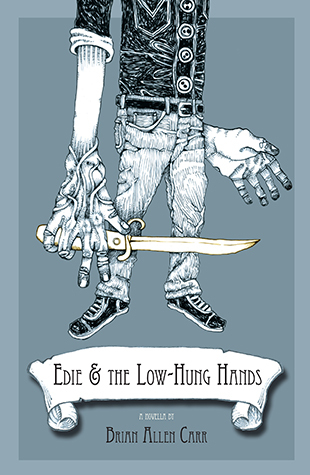 Brian Allen Carr’s novella, Edie & the Low-Hung Hands, is such a book. A frightening and exhilarating ride with a heart that darkens as it expands. Marlet is the second son born to a joyless preacher and a sweet-breathed booze addict in the vaguely post-apocalyptic backwater of Victory, where clergy fight death-duels to increase their congregations, and where Marlet’s freakishly long arms and hideously big hands are the source of constant (and often sadistic) scorn and disappointment for his otherwise respectable family. A loveless childhood leaves him with a propensity for swordsmanship that leads to an even greater propensity for killing. When a botched attempt to win over Edie – his life’s obsession – leads to the secret murder of his elder brother, Marlet’s decades of complacent angst boil over with him deciding to leave the only town he’s known in order to find whatever talisman might lead to his love’s reciprocation. Let the body count commence. It is to Carr’s credit that he renders one of the most unredeemable scumbags to inhabit the page (“I didn’t want to kill a woman. I hit her until she silenced.”) a surprisingly likeable fellow, an anti-hero whose violence-strewn quixotic wanderings are as provocative as they are addicting. Perhaps “likeable” is wrong. Marlet’s familiarly flawed humanity and unrepentant honesty serve to engross the reader, but it is ultimately what his journey signifies that resonates best: “You are uncertain about what lays beyond. You are so used to your veins filled with blood, your lungs with air, your eyes with visions, and your mind with thoughts. You’re fighting to keep yourself comfortable. When a sword is drawn on you, you know. There are two options.” A fight against absence, but also the motivation to deaden a pain that is more important than survival. Purchase Edie & The Low-Hung Hands HERE. Reviewer bio: Chris Vola is the author of Monkeytown, a novel. His book reviews appear in The Rumpus, The Collagist, PopMatters, Rain Taxi, PANK, and elsewhere. He is currently looking for a good recipe for kale chips that won’t melt his oven this time.